A weekly, three hour live program showcasing women’s and girl’s voices in music and across all genres as well as spoken word such as poetry and short stories. The sphere of sounds will be global, with attention given to our local women and girl talent as it becomes available. This program will bring the sound of women’s voices into the homes and hearts of Kohala. Music, writing and visual arts are my outlets for creative expression. 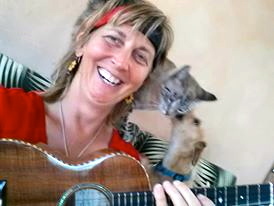 Although I enjoy singing, drumming, playing ukulele, piano and native flute, the only audiences interested in listening are our cats and dogs. Yet perhaps “interested” isn’t the correct word. It’s more like they are my captive audiences. My dream, at age 17, was to be a sound engineer in a recording studio, because mixing music on cassette tapes was a favorite activity of mine. Being a female made the path more difficult than I imagined in 1977, so I let it go, but in 2001, I was a DJ for a college radio station, WRPI in Troy, New York. They had a weekly program, which played music created and sung by women from around the world. I was slotted to DJ on Mother’s Day and brought my children to the studio. Kristin was 15 and opted to hang outside on the college campus with a few friends, but 9-year-old Montana wanted to sit inside. Working the mixing board was a very new experience for me so I asked Montana to sit across from me on a bench and keep quiet because we were on-air. After a half an hour, he quietly got up from sitting and stood in front of me. Without a word, he bent down, crawled under the desk and up onto my lap. I remained confident that I could operate the board, play cd’s, and speak into the microphone while embracing him. It was a perfect mother’s day moment.